Sadly, I only found out about this event after the fact. 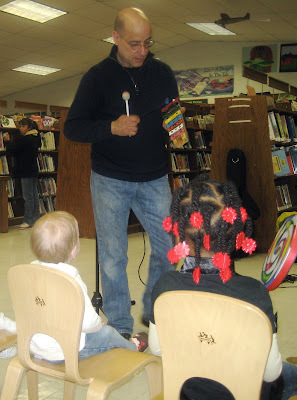 Last Thursday, the Sunset Park library hosted a kiddie concert with Louie Miranda. From what I heard (thanks, Rachel! ), "he had the kids eating out of his hands by the end." There were songs, instruments to play, and everyone's favorite activity: the parachute. Louie Miranda (formerly of Sunset Park, now living in another area of Brooklyn) has some videos on YouTube. Here's one that teaches you a musical mnemonic, or you can listen to a lullaby in Spanish. They are both great for kids and those who love them. It takes a special kind of person (in a really good way) to entertain kids without being creepy. He's able to do that. And he can sing without using goofy voices! Bonus! Check out the link to his website above for more songs and information about booking him for events and parties. 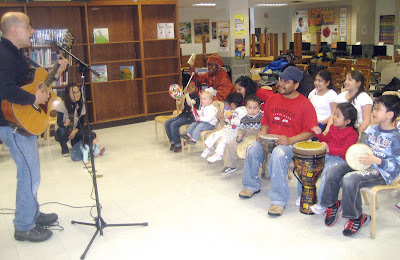 This is amazing..Children really enjoy the music.